I hadn't heard of the SkyGarden until someone mentioned it recently on the Europe forum over at Fodors but I had heard about the Walkie Talkie building it's housed in. This is the building that reflected the sun right onto someone's Jaguar and burnt the paint. A classic fail for the car, the architect and the developers. The Brits love a failure and it was immediately dubbed the Walkie Scorchie. Now, sometime later it has undergone an expensive modification and is no longer a danger to the local cars and shops. The mention of tickets lets you know this isn't like a stroll around Hyde Park. The experience isn't about the garden, it's about the view. You have to bring your tickets, photo id and pass through airport style security before you even make it to the lift. Then you head up 35 floors which is surprisingly quick and you come out in what looks exactly like an airport lounge. Sadly the hostesses at the cafe(who are right there when you emerge from the lift) are standing on a green shag rug, I think it's meant to be a playful reference to grass, but it just looks rather sad, like a scary overgrown bathmat! Don't get too excited, the "garden" isn't nearly as nice as the greenery in the Singapore airport, in facts it's quite pathetic. The whole place has the feeling of the public space in a shopping mall. But don't worry it's not about all that, it's about what you can see when you look out. 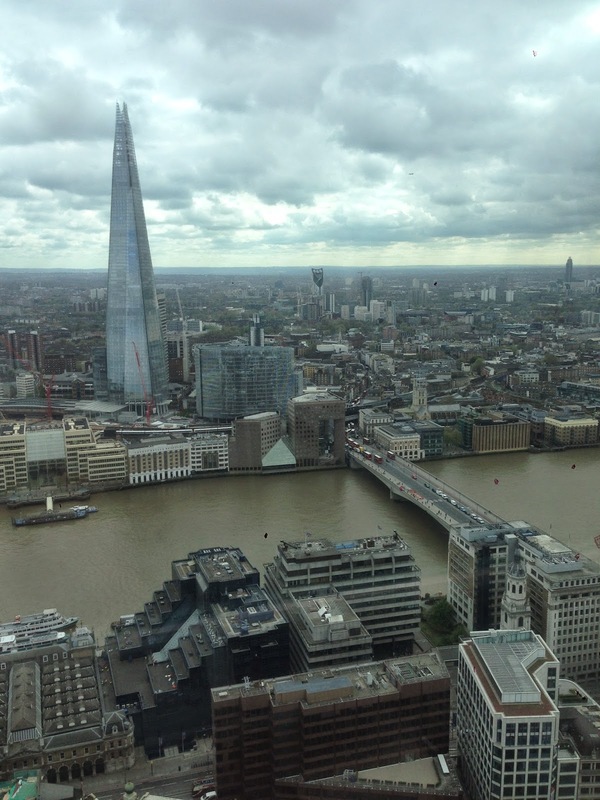 Ohh, the view is glorious and you can walk right around the building to get a 360 degree view of London. From here you can see its of the new buildings and it's a great place if you're an architecture buff. There is an open viewing deck on one side (where they carefully monitor people as they go in and out) with an incredible view over the Thames, Tower Bridge and the Tower of London. From this height you can rally appreciate the curves in the Thames. You can see it all, Canary Wharf, the Shard, St Pauls, the Barbican, the London Eye and Westminster in the distance, well D. could see that but I couldn't because I'd left my binocs at home! Here is St Paul's seen through the reflection and a closeup of the Tower. So, not impressed with the interior or the garden but the view is just spectacular and it's free which is always fab.